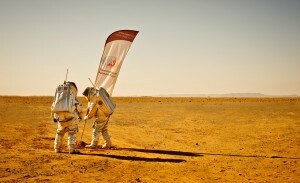 Along with Oman, Israel is in the final selection of candidates to host the Austrian Space Forum’s (OeWF) next Mars Analogue Mission “AMADEE-18”. 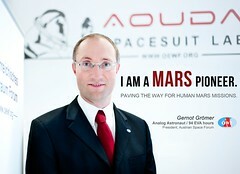 The Austrian Space Forum’s (OeWF) location scouts are lead by Mars Expert Dr. Gernot Grömer, President of the OeWF and Alexander Soucek, OeWF board member, and will be available for interviews in Israel as soon as they have concluded their travels. The Austrian Space Forum’s experts will visit Israel from 11th to 14th March. Hosting this mission would increase Israel’s visibility as a high-tech nation with a vibrant space sector, now also engaging in human exploration. If the host country selection of Israel would be successful, it would underline the nation’s reputation as internationally highly connected regional R&D leadership nation by presenting the Middle East from a new angle. 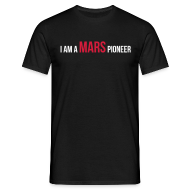 The main purpose of a mars simulation on Earth is to prepare for future crewed missions on the Red Planet. To perform the experiments, the OeWF is one of the five research groups worldwide to develop the prototype spacesuit “Aouda” which is worn by OeWF’s Analogue-Astronauts during its missions. WHAT ARE MARS ANALOGUE MISSIONS? The Austrian Space Forum’s missions draw considerable media and social media attention across the globe. More than one million people followed the last mission and got a closer look at the cutting edge of research in Austria. To perform the experiments, the OeWF’s Analogue-Astronauts wear the 45kg prototype spacesuit “Aouda” with an incorporated interface to assist the astronaut. The spacesuit is designed to deliver the astronaut’s vital data and mimic the restrictions of a spacesuit that will be worn by astronauts on Mars. Aouda provides movement restrictions, limited sensory input as well as the weight and an uncomfortably high centre of gravity typical of a pressure suit worn in space. Thus it enables the Austrian Space Forum’s Analogue-Astronauts to test equipment, workflows and experiments meant for the Red Planet under Mars-like conditions. By developing the spacesuit simulator the Austrian Space Forum also aims to optimize interactions with other (robotic) components – such as a rover – and minimize the risk of human contamination. 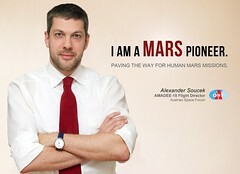 Dr. Gernot Grömer, President of the Austrian Space Forum, and Alexander Soucek, OeWF-board member, will be available for interviews to answer any questions you may have regarding the preparation for human Mars Missions and the Austrian Space Forum and its projects. World Space Walk 2013 – A Simultaneous Success!